After more than a year, and almost two years since our trip, I pick up our story on our third day in Mandalay. Time may have passed since our visit, but the memories are as fresh as if it was only yesterday that we walked the dusty footpaths of this ancient land. In fact, I’m starting thoughts and planning for a trip back to explore further, as well as see how much has changed. I’m sure it will be quite different now. So, let’s see now, after our failed attempt to see Mandalay Palace on our first day, we armed ourselves with US dollars to pay the ‘Mandalay Archaeological Zone’ ticket, met Naung Naung out the front of the hotel, and headed to see the Mandalay sights. We started at the famous palace. On entry, a number of informational boards were set up containing details about the thrones and royal regalia. J and browsed the boards before heading inside the huge complex. Sure it was all new and rebuilt after it was bombed out of existence during the war, but that did not detract from its sheer scale and imposingness. Imagine being a visiting dignitary in the 1700s, entering through the grand gates and being faced with these golden spires and ornate thrones set in this massive compound. Very impressive. Now empty, the darken rooms only hinted of the past luxury and opulence that they once held. Passing in and out a number of pavilions, we read about how one was for the Queen, or for the family, or for close advisors, or servants. Without many details to distinguish between them they sort of blended all together. Pity there couldn’t be more furniture, decorations and artefacts to display a more accurate picture of what they would have looked like in their heyday. At the far end, the last pavilion held some stunning pieces of clothing and royal ornaments in a mini museum, which I pored over, fascinated. Referencing my not great memories from the book I had read (Glass Palace), I tried to imagine them in real, day-to-day use of the royal household. Dashing between shadows, we made our way under the eaves of the numerous buildings to the tower near the entrance. The day was already boiling hot and the back of my tee-shirt was already wet from perspiration. Rushing to the shade, we didn’t stop at the lovely looking pool or bathing house beside the tower. Unlike the rest of the buildings, the white-washed walls looked old and may have been the original structures. Bright under the stark sunlight, the white walls and arched pergolas stood out against the other red buildings. Snaking around the perimeter of the tower, a hundred steps lead to the top that commanded a grand view over the entire palace compound and beyond to Mandalay Hill. From here, the total area of the palace grounds became evident. A green carpet of tree tops stretched far into the distance encircling the palace buildings, a stark contrast to the dusty, dry streets beyond the palace walls. Under the shade at the top, the slight breeze brought cooling relief. Returning to the relative comfort of the car, we enjoyed the air-conditioning as we headed back to Shwe Nandaw Kyaung, the Golden Palace monastery. 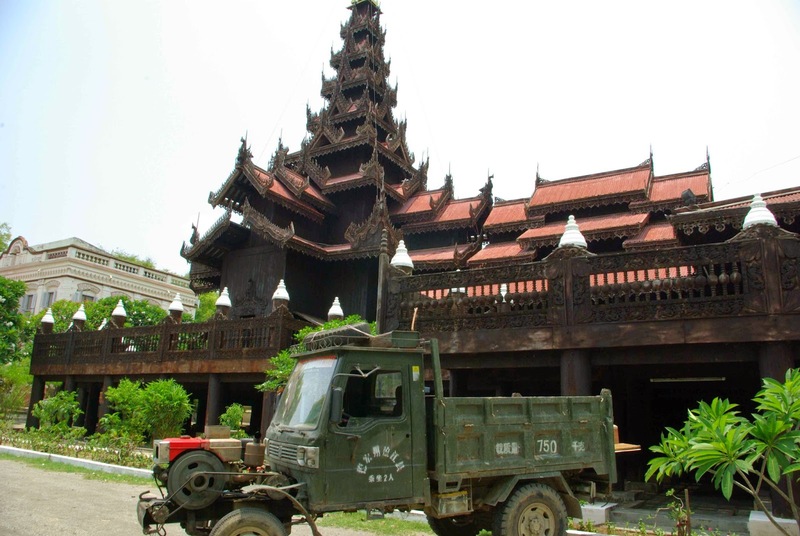 It is said to be the one of the only buildings left standing after the destruction that reined upon Mandalay during WWII. History says that it was built from wood relocated from the palace complex at Amarpura. King Thibaw had the building where King Mindon died torn down and built this monastery from its remains, dedicating it to the Buddhist order in 1883. Inside, there were beautiful and intricate carvings of the Jakata tales, stories from the Buddha’s previous lives. Every wall, door and panel held mythical animals and dancing figures. Unlike many Buddhist temples, there was not a huge alter room, but one chamber did contain a modest shrine with gold-gilded posts and Buddha statue. A smaller, pale Buddha of alabaster on simple wood pedestal sat centre place in the adjacent room. Similar to Shwe In Bin Kyaung teak monastery we visited the previous day, this was truly a treasure of Mandalay, and Myanmar, and I only hope efforts are put in place to preserve the superb carvings. Just a few hundred metres away was Maha Atulawaiyan (Atumashi) Kyaungdawgyi (monastery). 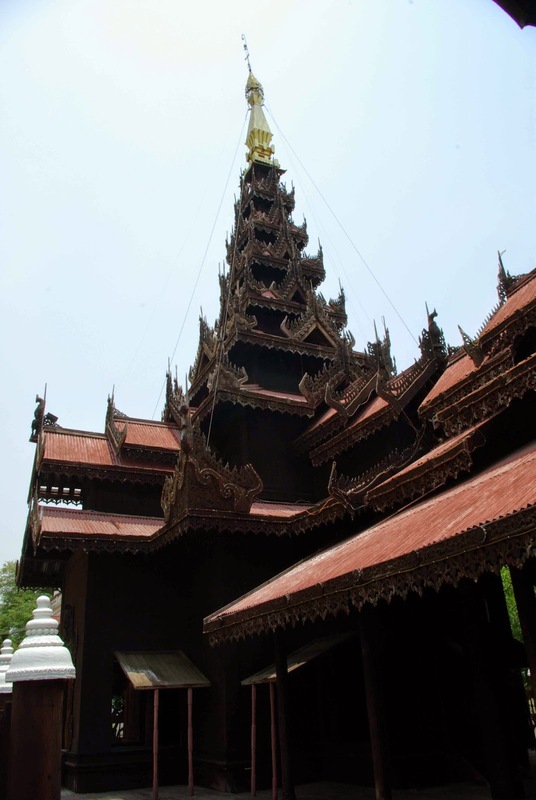 It is the largest religious building built during the time of King Mindon, completed in 1877. In 1890, it was used as a British military barrack and mysteriously burned down. Much of the structure survived and it was re-built and re-opened in 1996. Its interior was almost boring, pedestrian in comparison to the ornate decorations we had seen. But its exterior was unusual with white balustrades and ornate archways with elaborate carvings including peacocks. We had a look around but didn’t stay long. It was still late morning. Naung Naung asked if wanted to see some more, suggesting another teak monastery that he knew but wasn’t as famous as Shwe Nandaw. We drove to the area around base of Mandalay Hill along the same road that we took when we went to the summit. We pulled into a small driveway that from the outside looked like someone’s property. Inside, we found a well maintained garden and an impressive teak building. Not as ornate as the others, it was still very impressive with a seven-tiered central spire and carved detail around the eaves and balconies. Inside was very dark with little on display apart from a single marble Buddha statue on a small alter. The most bazaar thing was an old WWII jeep, missing its front fenders, sitting on the lawn in front of the building. Unfortunately, I didn’t find a name or any details about this place. Some research I’ve done since the trip shows it (I think) as a replica of Bargaya monastery that’s in Inwa. J and I relaxed in the shade of the peaceful compound as an elderly monk watered the garden. We returned to the hotel and had a late lunch. Zegyo market was a block or two up the road, and J knew I wanted to have a look around. By now, the temperature was over 45 degree Celsius, worse in the sun. Both J and I made use of our umbrellas to repel the sun’s burning sting, but the heat was amazing. The market itself wasn’t too interesting, with mostly local wares and apparel. At least we didn’t get hassled to buy anything, but I was hoping to find some local treasure. Returning to the road, we saw a few shops on the other side selling jade and jewelery. Stepping in, I seriously thought J was going to melt. Somehow, it was hotter inside the store, in the shade, than out on the sun-baked road. Rivers of sweat poured down his face, back, arms and legs. The lovely shop assistants handed J some tissues, taking sympathy on his discomfort. We bought a little jade elephant for J’s mum at a very cheap price. Concerned that J would dissolve into a puddle of sweat, we headed back to the hotel and jumped straight into the pool, after a litre or two of replenishing fluids. That’s where we stayed all afternoon, talking with a few other hotel guests about their travels and experiences. One lady made a poignant point; “Travel is not a vacation, it’s an experience.” I couldn’t agree more. For me, I can sit and read a book on the beach at home, or sleep in. But I can’t see the magnificent sights, meet people from all corners of the globe and sample local culture anywhere else. For our last night in Mandalay, we wondered around the nearby streets, having dinner at another chapatti stand. The fresh baked flatbread was filled with fragrant curry potatoes and served with chutneys which were delicious. There were more people out and about this night with more shops and stands open selling their wares. Too tired to walk much, we headed back to enjoy a cool beer before re-packing in preparation for our flight to Heho and onward to Inle Lake. Reflecting on our past few days in Mandalay, I was so happy we chose to come despite reading forum posts and travel articles saying that it was an uninteresting, dirty city. So, the main town wasn’t pretty, but the sights and experiences were well worth it. If (when) I return to Myanmar, I will definitely return to Mandalay.